with eggs, sausage, cheese, and french fried onions. What a bummer! I just tried to look up the Shorehouse Cafe in Long Beach, CA, where I got the idea for this tasty breakfast/brunch item, and I see that it's CLOSED! Such a bummer. Well, I guess I won't feel too bad for stealing their idea then. Sigh. At any rate, it WAS at the Shorehouse Cafe on Second Street in Long Beach, California, where I used to eat this breakfast/brunch somewhat regularly. I went there with friends, boyfriends, and then my husband. It was one of those places where we'd say, "Remember that time here when..." only to realize it was some OTHER person we'd dated whom we were with at the Shorehouse Cafe at the time. That was many moons ago, though, and today, as I was putting together Sunday afternoon lunches for my kids, I remembered this breakfast sandwich that I loved so much. It's a pretty basic thing that you can mix up and add any ingredients you'd like. Today, for me, it was eggs, breakfast sausage, cheddar cheese, and French's French Fried Onions. The onions were an afterthought, but they really were the "icing" on this sandwich. Glad I never did put those things away (and that I didn't snack them all away) after making green bean casserole on Christmas. The recipe below is simply what I did, but again, this sandwich is wide open to interpretation. I really just wanted to take a pic of the delicious thing and post it on my blog here. Cheers! Slice the croissant horizontally. In a 400 degree Fahrenheit oven, heat the croissant (closed) until crisp on the outside and warm on the interior, about 10 minutes. While the sausage cooks, beat the eggs with the half and half (or milk) until thoroughly blended and bubbly. Add the beaten eggs to the pan that is still over medium heat, cook and stir gently with a silicone spatula until eggs are just set and have no visibly wet/shiny bits. Salt and pepper to taste. 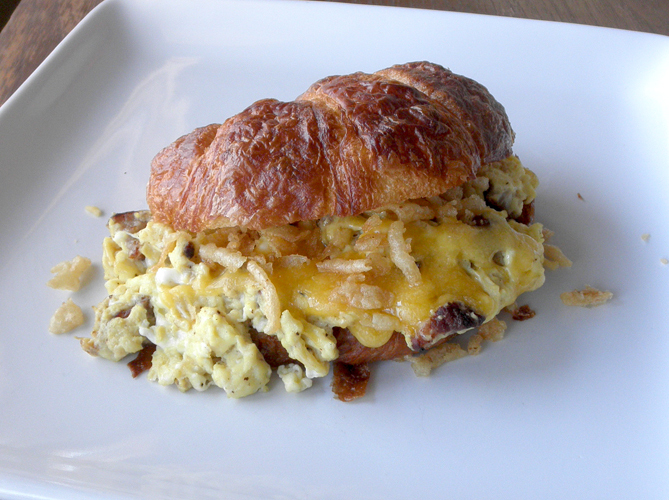 Place the croissant open faced on a baking sheet, place eggs/sausage on one side, sprinkle eggs with cheese and onions. Close sandwich and return to oven for 2-3 minutes to make sure the cheese gets melted. Serve hot with a knife and fork. I LOVE agood breakfast sandwich and that one looks so good!